I had a leader email me recently requesting advice on dealing with cliques. Unfortunately this problem is all too common. Whenever a group of women gathers together smaller groups are bound to form. As leaders we want to see our women bond and new relationships form. 1. Be intentional about grouping women at our events. 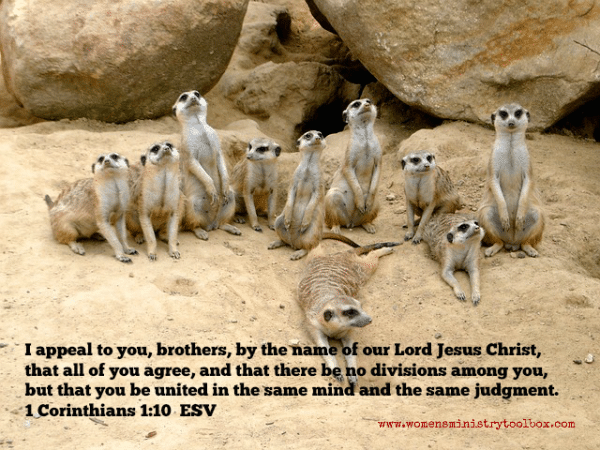 Pre-select small groups and discussion groups (separating those that need to be separated). Whenever possible, don’t let them chose their own groups! 2. Use icebreakers to get women interacting with those outside of their normal group. Place stickers on their name tags, distribute colored cards, etc. to place them into groups for games. 3. Remind women to be welcoming. Encourage them to talk to someone they haven’t met before the event is over. Women forget what it’s like to be the new girl. 4. Pray boldly that God would make women aware of the effect of their actions. That He would soften hearts towards others in the group. That women would not feel excluded. For protection of your women and your ministry. Pray for unity. 5. Prayerfully seek out a member of the clique that may understand your concerns. Assume that their exclusion of others unintentional. Your approach must be one of concern and love. Lovingly share your concerns (without “outing” the women who’ve felt slighted) and then wait and pray that God will bring about a change. 6. If you are dealing with “mean girls” seek your Pastor’s advice. Discuss whether or not the group needs to be confronted and how. He may have information that will lead to a greater understanding of the situation. He may also need to be present for that discussion if deemed necessary. 7. Set up a new small group ministry, such as Sister Six, which places women in new groups for 6 months of fun and fellowship. Or maybe you need to add small group interest groups (exercise, walking, scrapbooking, knitting, book club, etc.) to bring women with like interests together. 8. Put guidelines in place for online communication your ministry uses – prevent mass emails to the whole group. Block messages and posts if necessary. 9. Have a training session on cliques with your Women’s Ministry Team. Sometimes our teams are perceived as cliques! Discuss if this is a problem your ministry is facing and brainstorm ways it can be addressed. 10. Accept the fact that women are going to group up and not everyone is going to click. Pray and seek wise counsel to make certain you are not making a bigger deal out of it than it really is. Sometimes our perceptions are not accurate. Truth be told, it’s highly unlikely we’ll be able to rid our ministries of cliques. It’s one of many ways Satan works to sabotage the work that we are doing. With prayer, grace, and intervention, I do believe we can reduce the harm caused. 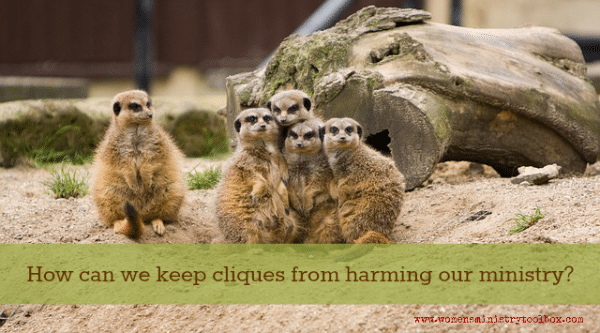 Your turn to share: Are cliques a problem at your church? Do you have any advice on dealing with them? Eva, I am praying God gives you eyes to see and ears to hear ways that you can lessen the effect the cliques are having on your ministry and the unity of the women in your church. Setting up Sister Six groups is a great start! Sometimes women just need to make connections outside of their group. Another great way to get them interacting is with an icebreaker at your events. Just be sure to find a way to divide them up so they aren’t choosing their own group – ie. stickers on name tags, counting off by numbers around a table (1, 2, 3), drawing colored cards/chips/playing cards, etc. Let us know how it goes! We have cliques. What are some ideas to handle them. I have started Sister Six groups. Just this last Sunday registration sheets where handed out.